The FOX Sports Radio Network, based in Los Angeles, California, is a division of Premiere Networks in partnership with FOX Sports. 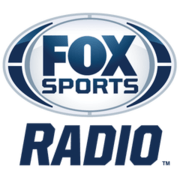 With studios also in New York, Chicago, Philadelphia, Tampa, Phoenix, Tulsa, Cincinnati and Las Vegas, the FOX Sports Radio Network can be heard on more than 400 stations, as well as FOXSports.com on MSN and iHeartRadio. Clear Channel Communications sold its stake in Sirius XM Radio in the second quarter of fiscal year 2013. As a result, nine of Clear Channel's eleven XM Satellite Radio stations, including Fox Sports Radio, ceased broadcast over XM on October 18, 2013. Outkick The Coverage with Clay Travis – 6:00 a.m. - 9:00 a.m. The Dan Patrick Show – 9:00 a.m. - 12:00 p.m.
Jay Mohr Sports – 3:00 p.m. - 6:00 p.m.
Steve Gorman Sports – 6:00 p.m. - 8:00 p.m.
J.T. The Brick w/ Tomm Looney – 8:00 p.m. - 11:00 p.m. The Jason Smith Show w/ Mike Harmon -11:00 p.m. - 2:00 a.m. The Ben Maller Show w/ Eddie Garcia – 2:00 a.m. - 6:00 a.m. The Jonas Knox Show - 2:00 a.m. - 6:00 a.m.
Anthony Gargano & Lincoln Kennedy - 6:00 a.m. - 10:00 a.m. The Big Lead with Jason McIntyre - 10:00 a.m. - 1:00 p.m.
Mark Willard & Joy Taylor - 1:00 p.m. - 4:00 p.m.
Steve Hartman & Brady Poppinga - 4:00 p.m. - 8:00 p.m.
Chris Broussard & Brian Noe - 8 p.m. - 11:00 p.m.
Arnie Spanier - 11:00 p.m. - 2:00 a.m.
Fox Football Sunday with Andy Furman & Brian Noe - 6:00 a.m. - 9:00 a.m.
Fox Football Fantasy with Michael Harmon & Dan Beyer - 9:00 a.m. - 11:00 a.m.
Fox NFL Kickoff Simulcast - 11:00 a.m. - 12:00 p.m.
Fox NFL Sunday Simulcast - 12:00 p.m. - 1:00 p.m.
Ryan Field & Robert Smith - 1:00 p.m. - 5:00 p.m.
Mike Hill & Ephraim Salaam - 5:00 p.m. - 8:00 p.m.
Jonas Knox & Brady Quinn - 8:00 p.m. - 11:00 p.m.
Arnie Spainer & Chris Plank - 11:00 p.m. - 2:00 a.m.
Los Angeles, California AM 570 FOX Sports L.A. Flagship station of FOX Sports Radio, Los Angeles Dodgers Radio Network, and UCLA Sports Network from IMG. Petros and Money (Petros Papadakis & Matt Smith) weekdays 3-7 pm. Aurora, Illinois AM 1280 WBIG Chicago affiliate. Flagship station for the Kane County Cougars; affiliate for the Chicago White Sox, Chicago Bears, and Chicago Bulls, Batavia Bulldogs High School Football and West Aurora Blackhawks Basketball. Local programming, affiliate of LSU Tigers sports radio network and New Orleans Saints football. Boston, Massachusetts Talk 1430 Partial affiliate; nights. Wolfeboro, New Hampshire 1420 WASR Partial affiliate; overnights and weekends. Affiliate for the Boston Red Sox. Dayton, Ohio Fox Sports 980 Flagship for the Dayton Dragons and Dayton affiliate for NFL on Westwood One Sports. Holds the distinction of being Dan Patrick's hometown affiliate (Dan's first on-air job was at sister station WTUE in the late 1970s). Toledo, Ohio Fox Sports Radio 1230 WCWA Flagship station of the Toledo Mud Hens, Toledo affiliate for the Cleveland Indians (shared with sister station WSPD). Midland, Texas/Odessa, Texas KWEL Weeknights 11 p.m.- 6 a.m.; Saturday 6 p.m.- 6 a.m.; Sunday 5 p.m.- 6 a.m.
Seattle/Tacoma, Washington (Seattle) Sports Radio 950 KJR Seattle-Tacoma affiliate of The NFL on Westwood One; simulcasting on KJR-FM 95.7 HD-2. Yakima, Washington 1390 AM The Fan and 104.5 FM FOX Sports Radio weekday evening and weekend only. Seattle 710 ESPN mon-fri daytime.